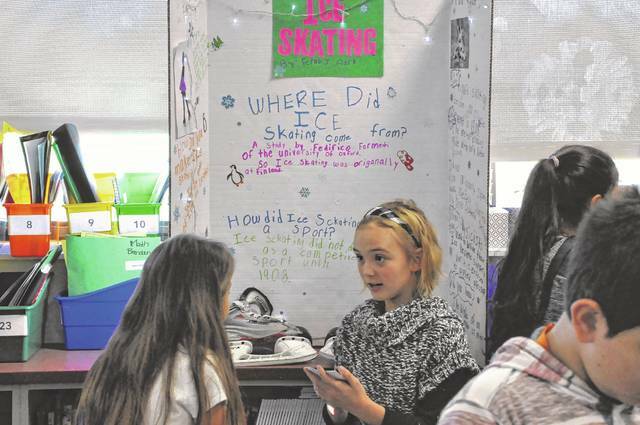 Schultz Elementary School fourth-grader Ferah Clark presents her research about ice skating to a fellow student on Wednesday. Students worked on the project one hour a week for six weeks before making the presentations. Fourth-grade students at Schultz Elementary School enjoyed some special presentations from fellow students this week in subjects like astronomy, psychology, biology and … cats? Schultz Elementary fourth-grade teachers Laurie Dieter and Sarah Heald hosted a gallery of student presentations. Dieter said the students spent one period a week for six weeks researching a topic they were interested in and were tasked with putting together a presentation for their fellow students. Heald said she also had her class begin research projects and the two classes were given the chance to look at each other’s presentations Wednesday. Kayde Smith, a fourth grader in Dieter’s class whose presentation was titled “How the Earth was Made,” detailed how minerals in space slowly came together to form Earth and said he studied the topic because he had always been curious about it. His classmate, Camryn Johnson, did a project about how intelligent animals compare to humans and said the desire to research the topic arose from her pets. Johnson said she really enjoyed finding the pictures to place in the slide show. Dieter said she was pleased with her students and glad they enjoyed the project. Schultz Principal Travis Woodworth also stopped by to see the projects Wednesday and said he enjoyed seeing the students present research on topics they enjoy. This entry was tagged delaware city schools, education, ohio, projects, research, schultz elementary school. Bookmark the permalink.